When Jessica’s partner disappears into the dark Tasmanian forest, there is of course the mystery of what happened to him - the deserted car, the enigmatic final image recorded on his phone. There is the strange circle of local women, widows of disappeared men, with their edgy fellowship and unhinged theories. And the forest itself: looming hugely over this tiny settlement on the remote tip of the island. But for Jessica there is also the tight community in which she is still a stranger and Matthew was not. What secrets do they know about her own life, that she doesn’t. And why do they believe things that should not - cannot - be true. For her own sanity, Jessica needs to know two things. Who was Matthew? And who - or what - has he become? Jessica is a PhD candidate living in southernmost Tasmania, studying the activity of the glow worms that inhabit Winter Cave, an untouched haven she discovered herself. Aside from study and work, Jessica spends most of her time with her controlling partner, Matthew. While he claims to love Jessica, Matthew is physically and emotionally abusive towards her. In her past, Jessica has suffered a number of traumas: she was raised in a doomsday cult, and was surrounded by cruel and damaged adults for her formative years. It is easier for her to avoid thoughts of her past, and to put all her energy into ensuring her relationship with Matthew endures and thrives, despite his awful behaviour. When Matthew goes missing, suddenly disappearing from his car into the thick Tasmanian wilderness, Jessica is heartbroken. The search for Matthew is stagnant from the beginning, with the police implying drugs are involved, and Matthew’s family assuming he’s taken off with another woman. As Jessica searches for her own answers, she meets a group of women whose boyfriends, husbands and partners have been, they say, taken by the woods and transformed into literal monsters. Krissy Kneen’s books always surprise and delight me, and make me think about the world from a new angle. 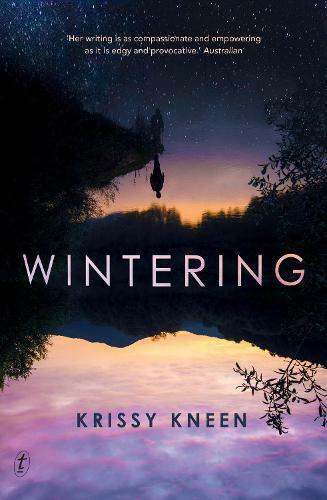 Wintering is no different in its impact on me, but is quite a different book for Kneen stylistically. This novel is at once a supernatural thriller and a sharp meditation on the legacy abusive men leave behind. More than this, though, it is a book about grief, and the feelings that may come out when the people you love the most are also the ones who hurt you. If you enjoy reading novels that challenge your concept of genre, I recommend this book to you wholeheartedly.